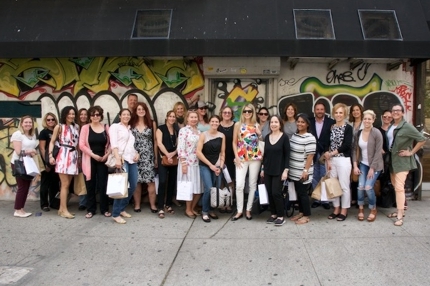 On June 9th, 2015, Amy Marks-McGee (Trendincite LLC) and Jeanine Pedersen (Takasago International Corp.) hosted the 8th annual WFFC Fragrance & Flavor Sensory Trend Excursion in Alphabet City/East Village, NYC. A group of 30 traveled the graffiti laden neighborhood exploring its hidden treasures seeking inspiration. The first stop was Matcha Café Wabi where attendees discovered the importance and health benefits of matcha, an ancient super ingredient form of green tea, and sampled an iced matcha latte. The next stop was SOS Chefs, which supplies high quality ingredients, spices, and herbs to many renowned New York City restaurants. It was here the group learned about the inspirational fragrance “Avenue B” give away Steven Claisse, Senior Perfumer, Takasago International Corp. had created specifically for this event. His inspiration for “Avenue B” evolved from the aroma that immediately fills the air as you approach the shop. Sustainable NYC, an eco-friendly store selling natural and repurposed items, was our next destination. Guests explored the wide variety of green home and personal care products, clothing and accessories. The shop even offers cold-pressed juices, frozen treats and desserts from its small vegan bar, which was made from recycled furniture and wood. The Good Beer NYC shop followed and guests enjoyed a sample of a selection of beers on tap. This artisan craft beer shop sells a variety of draft and bottled beers from independent, micro and nano-brewers. Many of the bottles featured incredible graphic designs and unique ingredients that were inspirational. 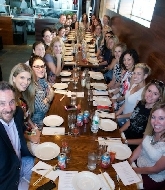 Lunch was held at the trendy Momofuku Ssäm Bar owned by Chef David Chang. The 5 course meal consisted of delicious Korean cuisine, including one of the bar's well known menu items, whole rotisserie duck. To conclude the excursion, guests visited Handsome Dan's Snocone & Candy Stand, a retro candy shop. Attendees enjoyed reliving their childhood and sampled Dan's famous cotton candy in Rose and Earl Grey flavors and signature snocones in Horchata and Bourbon Pear flavors. WFFC would like to thank all the attendees and members who made this day possible. The WFFC plans to repeat this excursion in the fall for those who were unable to attend the sold out event!